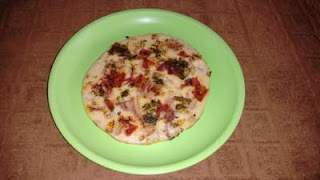 This is a very famous breakfast/snack dish from South India.It is healthy no doubt as it contains the dals plus the fermentation process.Nowadays you get the ready made batter mix in the market but the taste of home made fermented batter has no match!So go ahead for these delicious home made uttapams..
veggies - onion,tomatoes,green chillies,coriander leaves. Wash and soak the rice and dals for 6-7hours. Grind the mixture to a fine paste by adding little water at a time. Keep the batter covered outside the fridge overnight for fermentation. Next day morning add salt and baking soda and mix well. Chop the onions,tomatoes,chillies and coriander leaves finely. Drizzle one tspn of oil or ghee. Pour a laddle full of batter and let it spread(on its own). Add some chopped veggies over it and salt as per taste. Nice stuffs for foodie to be! Never tried these items in past! Take it here and see how to cook by self by seeing these step by step cooking method. Taste and savory choice could not be prep artificially if there is no value of traditional spices to warm up the dining table. We are a food wholesale marketer specialized in spice cuisine like turmeric, cumin, garam masala, edible oil to meet your requirement here at scwl-india.net.